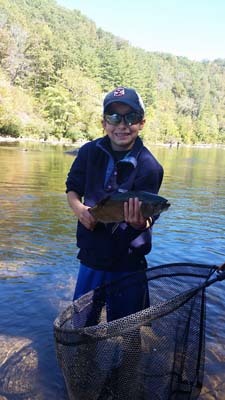 How to choose a fly fishing guided trip in NC can seem like a daunting task at first for the general public. Some search for trips like going on Travelocity attempting to save $$ for their experience on the water. These will typically not ensure the best-valued experience overall. Others think that a brick and mortar fly shop will offer the best-valued experience overall for a day. Once again these will typically fall into the Golden Arches approach of “you get what you pay for” for the day. I am partial to the concept of independent guides typically offer greater value to the client. Google Al Troth in Dillon, MT if you need more proof. Al guided often on the Big Hole and Beaverhead Rivers from 1973 until his death in 2012. The man invented the most popular fly with the Elk Hair Caddis. He also re-invented the Pheasant tail nymph from Frank Sawyer with the use of modern materials. Two of the most popular fly patterns ever used for fly fishers. Did Al work for a brick and mortar shop? Did he work for Orvis? No, he was an independent guide all of his years in retirement-sharing his love of the sport with others. Most of my independent guide friends across the country also go the extra effort to accomplish credentials through Fly Fishers International with teaching casting, have first aid qualifications, and many have ACA whitewater training on top of that! These are just a few examples of going the extra step to better their personal journey of fly fishing. They are tied to their businesses because they are the sole owners. No one works harder for quality when they are directly tied to their own business! Many are among the most accomplished I know for their area of discipline. They also consistently set the levels of par on their home waters. Most of the brick and mortar shops will offer you averages of what is expected. Less experienced guides that typically lob bobbers throughout the day for your experience. They tend to not offer much advice for casting obviously when you look at most of the trips on the water. Not just on my local rivers here in NC, but all over the country! The Yellowstone this summer had hundreds of guide trips on the river when we stayed south of Livingston. Most of these folks lobbed bobbers less than a few feet past the oars! The sport has seen such an increase the past few years with new fly fishers which is very positive for the sport. I constantly ask myself is the sport heading in a positive direction with education or is it a regression? In many ways, brick and mortar franchises are directly responsible for the regression because they tend to be more concerned with selling gear than teaching. Fly fishing is a very small segment for fishermen in the United States. Conventional tackle fisherman equal roughly 50 million people! Less than 10% pursue fly fishing out of that figure. If instructors fail to teach about reading water, temperature, hook sets, casting, tactics, and strategies overall then they are not really teaching you how to conquer water on your own for your next adventure. In other words, if you stay dependent on always having to get a guide for a fishing trip it is because you have not learned these things on your own. Doing your homework on these matters is really up to you the consumer for a positive experience on the water. It is for this reason I often think America as a whole is regressing. Fly fishing is not about your fly line, your rod, your leader, or your fly-it is about you! It is also about FUN and your overall experience on the water. You can have fun and still learn to build your knowledge base for improving your skills. If your experience on the water made you better to conquer challenges as they arise down the road than you had a great teacher. Gather your information wisely because it really is the first step for heading down the right path for your fly fishing journey! This weekend had huge numbers of folks from the Buckeye FFI chapter and the Charlotte TU club on the water. I wonder where they got their information on fishing conditions before planning this excursion? We normally are seeing trout numbers in the 80’s this time of year. Presently those numbers are lower due to all of the hot record breaking temps. Next time you shop online choosing a guide look at the number of years they have pursued fly fishing. There are certifications for casting (FFI), Red Cross first aid, whitewater experience (ACA), and many others that indicate a level of professionalism. Fall Delayed Harvest Trout Fishing Season NC!